ISLAMABAD – Supreme Court Bar Association (SCBA) President Asma Jahangir and Pakistan Bar Council (PBC) Vice Chairman Latif Afridi on Friday held a meeting with Chief Justice of Pakistan Iftikhar Muhammad Chaudhry and apprised him about their reservations over a recent full court meeting of the Supreme Court that decided to appoint two retired Supreme Court judges on an ad hoc basis. 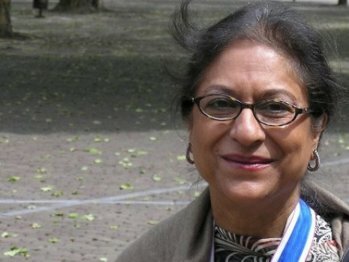 Talking to reporters later, Asma said that they had “apprised the CJP about their reservations over the full court’s resolution of appointing Justice (r) Rahmat Hussain Jafferi and Justice (r) Khalilur Rehman Ramday as ad hoc judges of the Supreme Court.” She said that the SCBA wanted elimination of ad hoc appointments in the judiciary, thus it was opposing the reappointment of the two retired judges. She hoped that both judges would recuse themselves from the issue by not accepting the request of their ad hoc appointment. “If the president approves the ad hoc appointment of both the retired judges, then it will be considered that the government had approved the appointment for its own purposes,” Asma said. Earlier on Thursday, the PBC executive committee held in a unanimous resolution that the appointment of both the judges on ad hoc basis was in violation of Article 182, as amended under the 19th Constitutional Amendment, and unprecedented. The PBC executive committee said the resolution passed by the full court for appointment of ad hoc judges was against the spirit of the Al Jehad Trust case verdict and the ad hoc appointments in such a manner also militated the independence of the judiciary and even violated the SC’s July 31, 2009 verdict.